Could you eat 45 habaneros in 20 minutes? I’m not a fan of eating contests, so when our intrepid editors here at the Digest blog tried to volunteer us to participate in the 4th Annual Habanero Eating Contest this past Father’s Day–Lesley Bargar Suter strongly suggested me—a slew of lame excuses from “I’m outta town” (yeah right, Randy) to acid reflux (I demand a doctor’s note!). So much for never asking a soldier to do something you wouldn’t do yourself! 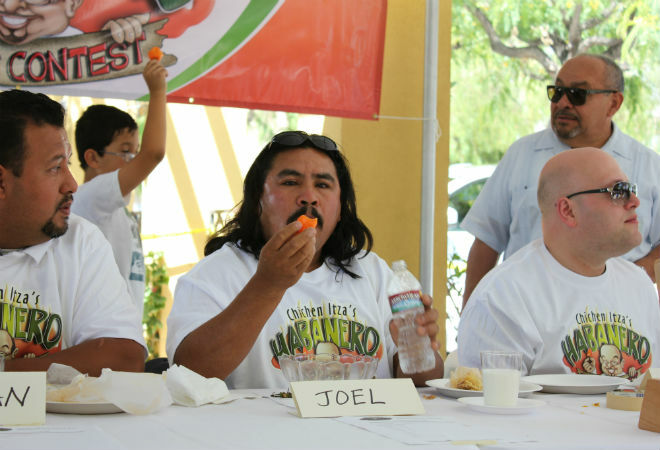 This year a dozen contestants took on the challenge of eating as many habanero peppers as they could in 20 minutes. Each contestant was provided unlimited water and milk. After all—habaneros are an ingredient used in homemade pepper sprays, with a range 100,000-350,000 on the Scoville scale—so, these merciful offerings were for the safety of the contestants. Each brave soul also received delicious tacos of cochinita pibil from the event M.C. and owner of Chichen Itza, chef Gilberto Cetina. Once the hangman—Cetina—handed out the provisions, the contest began. Bring on the pain! Unlike the smaller and hotter ghost peppers, habaneros can’t be easily swallowed (unless you’re a drug mule), so the crunchy, orange capsaicin bombs had to be chewed, allowing the juices to sear your mouth and throat while punishing your tongue. As flesh turned red, tears flowed, and contenders began to practice Lamaze breathing, an older gentleman, Pedro N., was the first to tap out. The rest stayed at the table, with some trying to merely save face by averaging just under 20 habaneros, while three fire resistant warriors, Joel, Eric and Octavio, pushed each other until the very end. Joel was the victor, eating 45 habaneros–a new record for this event–with Octavio (42 habaneros) and Eric (37 habaneros) taking 2nd and 3rd place, respectively. When asked how he felt, Joel grimaced and said, “stuffed, and my stomach is on fire.” For my part, I went inside the restaurant and enjoyed queso relleno (Edam cheese stuffed with picadillo in a white sauce) with 3 whole habaneros (more than I usually have with a meal). I was fine until the third one–which was hotter than the first two–gave me three minutes of discomfort. I can’t even imagine eating 45. Please write us if you’d like to see editors Lesley Bargar Suter and Garrett Snyder do this next year. Next article“Crazy Pyes” Food Truck, Movie Night with Roy Choi, and More!